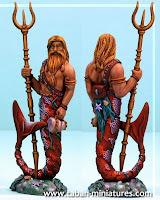 ...and lots of thought, dice rolling and skimming through the other army books I have decided to introduce 2 new units to the Nautican ranks and move some other units around (notably the undead mariner souls / ghost wreck). Plain rank and file "archers", non-skimishing, lightly armed and armoured Bs3 speargunners with str3 spearguns that shoot 24" (probably, although I might make this 16"). Note: no poison, unlike the elite Bs4 Deep Divers who have 16" spearguns + poison. Lightly armed and armoured (or maybe no armour at all) "fast cavalry" equivalents. Can wield spears or (possibly) javelins. They ride on top of the crest of a wave that will crash into enemy ranks causing impacts hits (maybe d6 str4 - to be decided). The wave only lasts for their first charge of the game. Note: there will be a restrictions on the use of this unit; 10-20 models in size and only 1 unit per magic power dice that the Nauticans start the battle with.